Getting Specific: How do we explore how mobile users find & use our site? Web Metrics: Basics for Journalists explained some of the basic reports Jenny can run looking at all website users. To look at these reports for mobile web users only, Jenny can use a feature in Google Analytics called SEGMENTS. 1. Jenny goes back to the standard Audience Overview navigation screen. Looking above the graph, she sees an ALL SESSIONS icon, and a grayed-out icon next to it labeled ADD SEGMENT. When Jenny clicks Add Segment, a dropdown menu appears with many options, including one for MOBILE TRAFFIC. 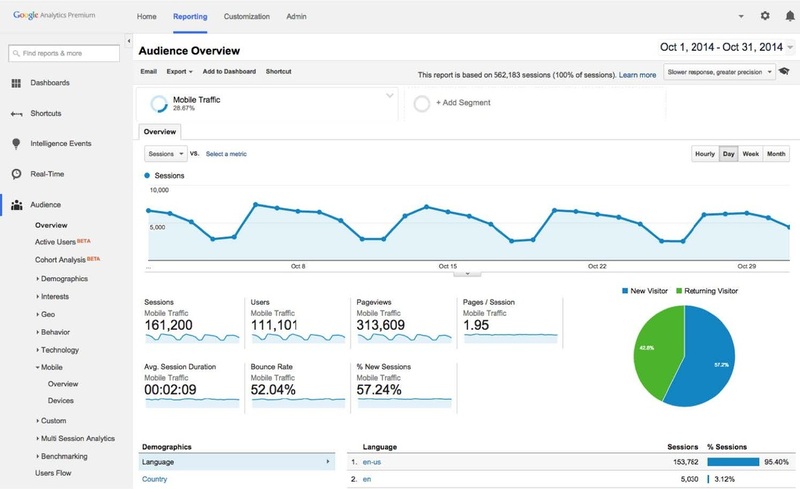 Jenny selects Mobile Traffic, and clicks APPLY, and the Audience Overview report changes. 2. Using the All Sessions > Add Segment > Mobile Traffic path brings up a graph similar to the one Jenny already created in Mobile Overview, with an orange line added for mobile users. A new table is also presented underneath the graph, with Mobile Traffic vs. All Sessions clearly separated. To explore just how mobile users used the site, Jenny removes the line for All Sessions by clicking Remove on the dropdown menu. Now all she sees is the sessions from mobile web users, and she’s ready to explore the other reports Google Analytics offers that will show her how mobile web users found specific stories and which stories had the highest bounce rates. 3. Jenny is curious to find out how many people used their phones or tablets to read a story she wrote on campaign fraud. She runs a report using the following path, located on the left side menu: Behavior > Site Content > Landing Pages. This will allow her to find how many mobile web users read her story first when visiting the site. Once she has clicked on LANDING PAGES, Jenny sees a list of ten URLs. She doesn’t see her story’s URL on the list, so she types the URL of her story in the search box at the top of the list. That pulls up her campaign fraud story, and Jenny can now see a table of data such as pageviews, users, sessions, and bounce rate, specifically for her story. How did mobile users find her story? Jenny clicks an icon above the table named SECONDARY DIMENSION. That presents a dropdown menu with a series of options. By clicking Acquisition > Default Channel Grouping, Jenny gets a table showing how many visitors accessed her story through search engines, by typing in the direct URL, or through social media.